We are in the midst of a global productivity crisis. The IMF estimates that if productivity growth had followed its pre-2008 financial crisis trend, overall GDP in advanced economies would be about 5% higher today. However, to blame everything on the financial crisis is misleading. The overall trend in productivity growth is stagnant and has been on a downward trend for the last several years. This is costing the U.S. a staggering $450–$550 billion a year. In the U.K., concern is such that there have been calls for the government to set new targets and create an independent watchdog to monitor progress to improve national productivity. There is also a workforce engagement crisis. Most people are simply not engaged at work, with industry research showing that typically 66% of people are either partly or not engaged at all at work. This means that only 1 in 3 people at work are fully motivated and productive. Yet most companies are oblivious to this fact. Some run annual employee satisfaction or engagement surveys, which given the above, are clearly failing to address these problems. Look around the room when you are next in the office; if you think that 2 in 3 of your colleagues aren’t contributing to your shared mission, then read on. 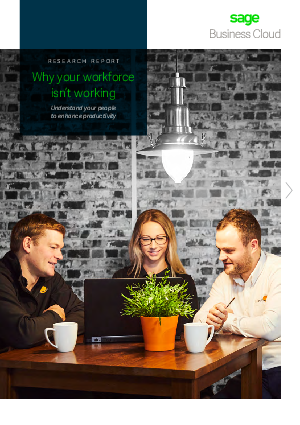 Sage recently surveyed 3,500 employees across companies of all sizes in the the U.K., U.S.A., and Canada in order to get their perspectives with a view to addressing these issues. This report summarises the findings.